The Time field is used to select a time from a dropdown field. The start and end time can be adjusted as well as the minutes between each time option. In addition to the standard field options, Time fields have a 'Clock Settings' option. 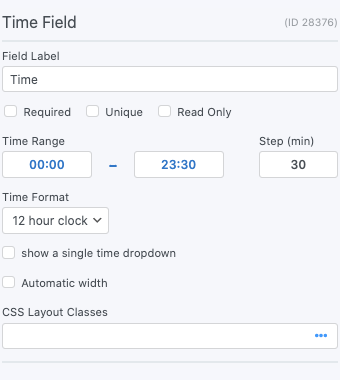 Choose between a 12 and 24 hour clock, set the minute step, and select the start and end time for your Time field. In Formidable Forms v2.03 and later, the time field will appear in the form with three dropdown fields: hours, minutes, and AM/PM. You can check the box for show a single time dropdown to show the time field in a single dropdown instead. Set a dynamic default value in your Time field. If you would like to retrieve a value from an entry see the Get a Value From an Entry page. If you would like to set a default value, see the Default Values page. Display the value submitted in a Time field in a form's confirmation message, email, or View. Display value: Display the value submitted in a Time field. Replace x with the ID or key of the Time field. Time Format: Change the format of the displayed time. Display as a 24-hr clock format, e.g. 18:30. For more format options click here, scroll down to the parameter section and look under 'Time'. Black out time blocks with the frm_allowed_times snippet. Calculate total time with the frm_validate_field_entry snippet.